Netflix is rebranding its 12-year-old movies-by-mail service as Qwikster and adding video games to its catalog. ATLANTA (CNN) -- The ubiquitous red envelopes will endure, but they will carry a new name. Netflix is rebranding its 12-year-old movies-by-mail service as Qwikster and adding video games to its catalog, Reed Hastings, the company's CEO, announced Sunday night. The Web-streaming portion will continue to be called Netflix (NFLX), he wrote on the company's blog. After the separation, people who subscribe to both services will have to log into two separate websites, Netflix.com and Qwikster.com, to manage their movie queues and account information, Hastings wrote. Customer reviews and ratings from Netflix will be ported to Qwikster for the launch, but after that, people will have to rate and search for movies on each site separately. Qwikster's site currently presents a landing page that says it is "launching soon." Hastings did not offer a timeline for Qwikster's debut. Andy Rendich, the operations chief and 12-year veteran of the company, will run the new mail-order arm. In addition to DVDs and Blu-ray discs, the new service will offer console games for Microsoft's (MSFT, Fortune 500) Xbox 360, Nintendo's (NTDOY) Wii and Sony's (SNE) PlayStation 3 for an extra monthly fee. The change will put pressure on GameFly, a competing service dedicated to subscription game mailings. "Members have been asking for video games for many years, and now that DVD by mail has its own team, we are finally getting it done," Hastings wrote. Responding to a question in the blog post's comments, he wrote, "Old Fogey discs will last a long time." Another person questioned whether Netflix was setting the DVD business up to be sold off later, and asked how long until that would happen. "A long time," Hastings replied. "We know the business better than anyone else." Dish Network (DISH, Fortune 500), which recently acquired Blockbuster (BLOAQ) in a bankruptcy auction for $320 million, is believed to be unveiling a revamped movie-streaming service on Friday. Netflix also faces competition from Hulu, YouTube and an array of new entrants. Netflix customers were incensed in July when the company announced that it would stop bundling the streaming service for free with DVD-by-mail plans, effectively increasing the price for some by as much as 60%. Hastings finally offered an apology -- not for the price hike, but for failing to clearly communicate why the change was being made. "It is clear from the feedback over the past two months that many members felt we lacked respect and humility in the way we announced the separation of DVD and streaming, and the price changes," Hastings wrote. "I messed up. I owe everyone an explanation." Hastings has worried for the last five years that Netflix will fail to successfully adapt its business to growing opportunities, such as online video streaming, he wrote in a rare public admission for the savvy Netflix co-founder. He said he hoped to avoid similar fates to Borders Group (BGPIQ), the bookstore chain that filed for bankruptcy this year; or AOL (AOL), the dial-up Internet king that is struggling to transform itself into an online media company, after a nasty corporate breakup from Time Warner (TWX, Fortune 500), which is the parent company of CNN. "In hindsight, I slid into arrogance based upon past success," Hastings wrote. 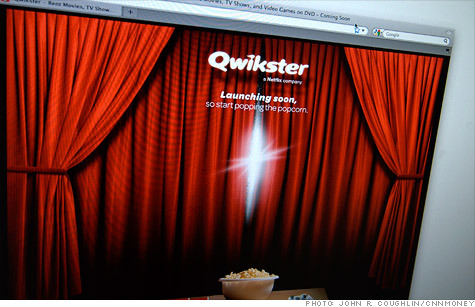 "Both the Qwikster and Netflix teams will work hard to regain your trust. We know it will not be overnight." In a video explanation, he clarified the company's reasoning for the changes, saying, "DVD and streaming were becoming more and more different, and we could do a better job for both services if we separated them." While Netflix is not going back on the price changes from earlier this summer, customers should not expect further increases, Hastings wrote. In his response to a comment on the blog, he said the adjustment was designed to help Netflix improve the quality of movies and TV shows available on the streaming service, which many say is lacking.